VICE-President Guy Scott has dispelled rumours being spread by the UPND in Kapiri Mposhi that President Sata is sick, reports the state owned but PF government controlled Zambia Daily Mail. Dr Scott said President Sata is well and working in China. The Vice-President was speaking at a rally held at Chipepo primary school in Kapiri Mposhi yesterday. Dr Scott was in the area to drum up support for Patriotic Front candidate Eddie Musonda in the April 23 by-election. The UPND is fielding Lawrence Zimba while UNIP is fielding Francis Mwape. 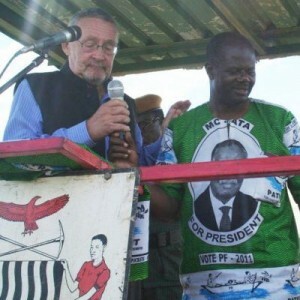 Dr Scott urged the people of Kapiri Mposhi to vote for Mr Musonda, whom the party has re-adopted to recontest the seat after successfully petitioning the election of Mr Zimba in the Supreme Court. He said President Sata would be coming soon to drum up support for Mr Musonda. “You will see Mr Sata will be coming soon to see you people of Kapiri Mposhi. This nonsense of saying that Mr Sata is sick has been going on for sometime, no-one in our party is ready to die any time soon,” he said. Dr Scott appealed to the people to vote for Mr Musonda so that the PF can deliver development in the area saying it will be difficult to work with an MP from the opposition. But Zambia reports reports UPND spokesperson Charles Kakoma said his party does not wish President Sata ill and dissociated the party from the accusations that they were spreading rumours about his illness. Kakoma said UPND was looking forward to President Sata concluding his five year term and that the rumours about his sickness should have emanated from somewhere else. He said much as they have different political views, the UPND valued human life and wish President Sata good health. UPND is fielding Rose Zimba while Francis Mwape on UNIP. MMD is supporting the UPND candidate. President Sata’s health has been deteriorating for some time and it has left him confined to State House with only limited public appearance and movements.